Honeywell Technology Solutions, Inc. awarded BenBeck II, Inc. the subcontract to construct a wireless controlled popup target range with various distances in meters. 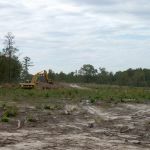 The scope of work included clearing, stumping, shaping, and grading of 20(+) acres of clear cut timber land. After grading as required, concrete bunkers with deflection timbers were placed at exacting distances for target placement. All disturbed areas were seeded and mulched or netting applied. Best Quality Work in the Wiregrass! ©2019 Beckham Septic. All rights reserved.